The 2012 edition of the traditional international RC51 meeting of Sociocybernetics will be held from 2nd to 6th of July at the Algarve University in Faro (Portugal). The conference title is “Complexity and Social Action: Interaction and Multiple Systems”. Particularly attractive is the old part of the city surrounded still by the Roman walls, which date back to the 9th. Inside a spacious open square that was once the site of the Roman Forum is a 13th Century Cathedral that faces the 18th Century Episcopal palace. An interesting building is the neighbouring 16th Century Convent that is now turned into the home of the city’s archaeological museum. Within it is a section devoted to the Arab occupation. The “golden” church of Nossa Senhora do Carmo is claimed to be the best example of gold-leaf woodwork in southern Portugal. It also contains the macabre spectacle of a chapel lined with the bones from over 1.200 monks! Next to the small boat basin bordering the Praça de Dom Francisco Gomes is a small Naval Museum composed of scale model boats and galleons showing the maritime history of the coast. There is also the Faro Jewish Heritage Centre, which consists of a cemetery and a small museum. Much of the city is now composed of partments and there are attractive shops and a particularly artistic theatre. Faro is also the home of the Ria Formosa lagoon, a nature reserve of over 17.000 hectares and a stopping place for hundreds of different birds during the spring and autumn migratory periods. The beach is almost 7 Kms distant from the city and is a long sandy spit reached by crossing a bridge not far from the International Airport. The municipal council has an active cultural department organizing different and various events during the year. 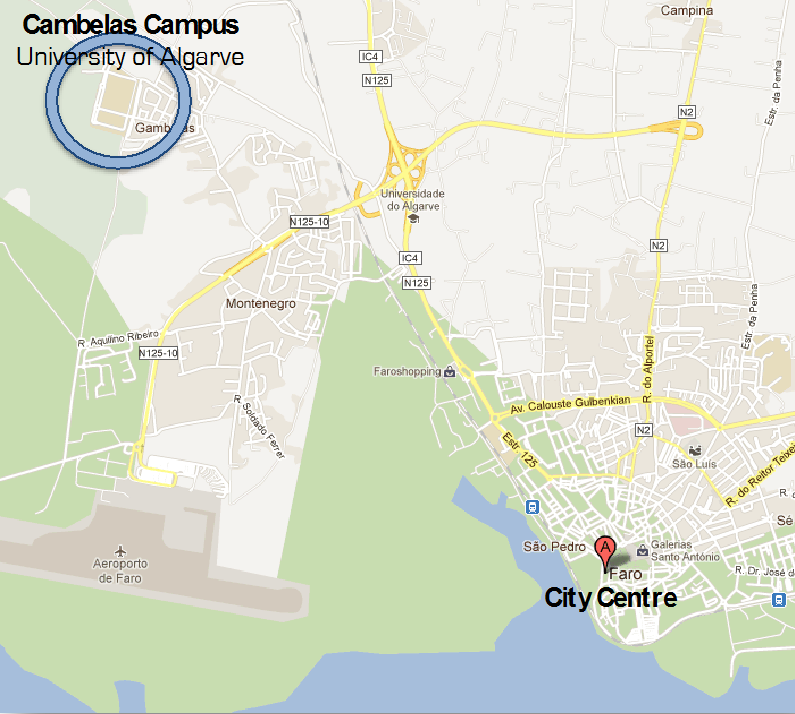 The meetings will take place at the University of Algarve, Gambelas Campus. The campus is about 5,5 km from the city centre and there are regular buses for this route. There are several flight companies flying to Faro International Airport. The airport is located quite near the city centre, around 6,5 km. To get to the city centre and back to the airport there are various public transport options like buses, taxis or bikes. 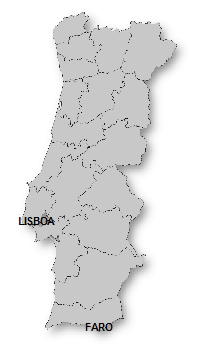 It is also possible to fly to Lisbon and reach Faro by bus or train. There are several available accommodation options. The University provides some rooms at its residences. Usually these residences have double rooms with shared WC (shared for 3 people). This option should cost around 17 € per person per day. The faculty campus is the ideal alternative to accommodate groups that intend to stay together. This reservation will be made by the Local organizing committee only. For those interested in staying at the faculty campus, you should send an e-mail to: dalilacerejo@fcsh.unl.pt in order to proceed with your reservation. 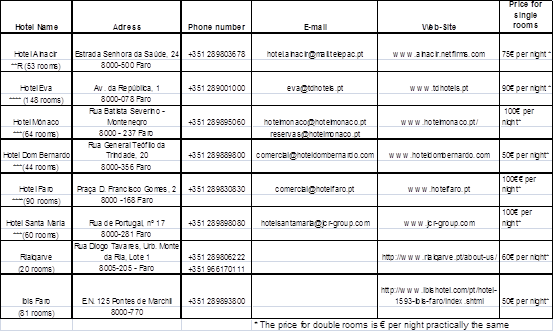 Reservations for other types of accommodation (e.g. hotels), must be made by those interested. Other the possibilities can be found at: Booking.com. Please note that the Algarve can get crowded during the summer time so it’s recommended to make the bookings in advance. During the conference period all the participants will have access to the university’s canteen, where a meal should cost around 4 €. There are numerous restaurants around town and we encourage everyone to taste some of Algarve’s and Portugal’s marvellous cuisine.